Today, after having viewed a High School V Planner that is being used for grades 1-4, I updated the High School V Planner. The two 4-Year Transcript worksheets were not populating. While the two 4-Year Transcript worksheets will work well if the planner is being used for grades, 9-12, they will not populate if using the planner for other grades. The 4-year transcript worksheets are not necessarily broken, the grades 9-12 are hard-coded and that prevented the data from populating. Additionally, while viewing the planner, I noticed a person named Bob is ever-present on the Data worksheet. With that brief introduction over, I will list the changes that I made to the planner. If you are using the planner for grades 9-12, there is no need to download a new planner. The cells that contain the school grades in 4-Year Transcript and 4-Year Transcript(2) were changed to populate with the school grades entered in the Data worksheet. 4-Year Transcript does not currently display the school year. I updated the cell to display the dates. 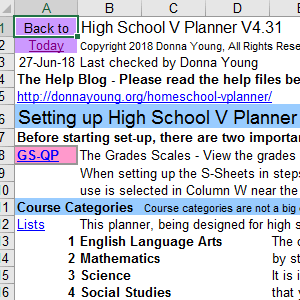 If you are currently using High School V Planner 4.3 and would like the 4-Year Transcript to display the school years, please input this code into the correct cells. You will have to Unprotect the 4-Year Transcript worksheet before making changes. Please remember to Protect the worksheet when you are finished. I changed wording on the data to suggest the typically entered school grade (9th, 10th, 11th, 12th). It is important to note that the High School V Planner is designed to be used for four consecutive years. Bob is now dynamic and will change to your child’s name. School Grades: This is a 4-year calendar, more precisely, 4 consecutive years. If using this planner for high school, enter grades 9th, 10th, 11th, and 12th into the fields (even if you are not using it for grades 9th-11th). High School V Planner is made a bit more user friendly to those using it for grades K-8 by making the grades dynamic on the two 4-year transcript worksheets. Bob is not hard-coded on line 60 in this update. Find out what the Dynamic Term Average Record is and how it helps you.